Are you experiencing problems with damp in your property? Damp is an issue that any home may be faced with and is triggered by a range of causes that are sometimes difficult for the untrained eye to diagnose. We are your local experts tackling problems with damp in homes and establishments across Dorset and Hampshire. If you are experiencing problems with damp in your property, please don’t hesitate to get in touch with us on 01202 737739. We will carry out a professional survey on site to establish the cause of the issue and suggest an effective solution. Our experts can help with any problems with damp your home may be experiencing, we cover all areas of Bournemouth, Blandford, Chandlers Ford, Christchurch, Dorchester, Lymington, New Forest, New Milton, Poole, Purbecks, Ringwood, Romsey, Salisbury, Southampton and Wimborne. Figuring out which type of damp is affecting your home is the first important step to removing all signs and symptoms for good! Contact us for expert guidance on identifying your problem with damp on 01202 737739 and for an accurate damp treatment price. Causes of damp are not always self-evident and can require a more trained eye to decipher. Our team are keen to work with you to get to the heart of your issue and provide a solution that will last. Get in touch today for damp treatment in Dorset & Hampshire! Why choose us to handle your problem with damp? We are a family run business who puts our customers at the heart of everything we do. 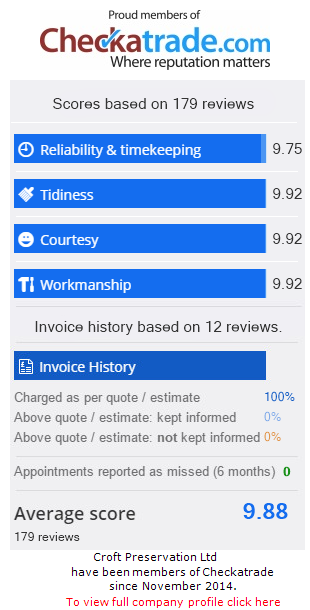 We are totally upfront and ensure that there are no additional costs when dealing with us; that’s why we are rated 100% for charging per quote on Checkatrade.com! We also know that your home and interior is valuable, which is why we take special care to protect your furniture, walls and flooring during every job. For more information about our range of services targeting problems with damp, contact us today on 01202 737739.